Typical Wind Damage to Municipal Buildings | The Voss Law Firm, P.C. While the frequency, form, and strength may vary, damaging and dangerous winds can happen anywhere in the United States. As homes and businesses report damage and clean up after a storm, there are also local governments, school systems, and other municipal bodies that have to survey the damage done and get ready to file their insurance claims for their wind-related losses. Although wind may not seem like the biggest threat to a municipality, compared to major disasters like hurricanes, the damage can still be very costly and interfere with the daily functions of critical buildings. This is exactly why it’s important to know what kinds of damage look for, where to look, and how to recognize it when you see it. According to the National Severe Storms Laboratory, winds are classified as “damaging” once wind speeds exceed about 50 to 60 miles per hour. The potential severity and scale of the damage increases as wind speeds increase, but even high winds produced in thunderstorms can be responsible for costly losses. 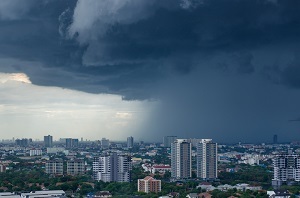 The damage from a single hurricane may be much more severe than the damage from a single thunderstorm, but keep in mind that thunderstorms are extremely common occurrences for many municipalities across the United States in the spring and summer months. Roofs. Roof damage is probably the most common complaint after a storm with very high winds. Municipal buildings often note damage to the roof membrane, shingles, flashing, and seams. When roof damage is being assessed, it’s important to work with contractors who are familiar with the types of roofing used and can spot the potential for deeper damage, leaks, and other issues that can be hard to see with an untrained eye. This is especially important for buildings with attached features like skywalks or with mixed roofing types. Windows and glazing. High winds can break windows, tear seals, and leave cracks and craters in glass components. Although it may not be the first area that you look for damage, don’t overlook glass features during your inspections after a storm. Leaks and cracks that go unattended can lead to further damage and costly repairs over time. Exterior equipment. Heating and cooling systems, communications equipment, electrical components, and other exterior equipment associated with a building can be damaged by strong winds. Make sure you have professionals check these systems thoroughly if there is a chance they have taken storm damage. Wall exteriors and doors. When winds reach very high speeds, exterior wall coverings can be stripped away or torn, and exterior doors can be significantly damaged. When wind damage is this severe, temporary repairs often become necessary to mitigate further damage and ensure the safety of the site. In very high winds, especially those associated with severe storms like tornadoes and hurricanes, partial or total building collapse is possible, especially if buildings aren’t designed to withstand the conditions or have been improperly maintained. High winds can also bring down trees and send debris flying that may puncture or damage buildings, and the severity damage may even exceed the direct damage from the wind alone. Municipalities seek legal advice for many reasons after a storm, but consulting with an experienced insurance law attorney can be an important step toward efficient resolution of complicated wind insurance claims. For more information about how we can help, reach out to the Voss Law Firm at 1-888-614-7730, or fill out our convenient online contact form with your questions and concerns.